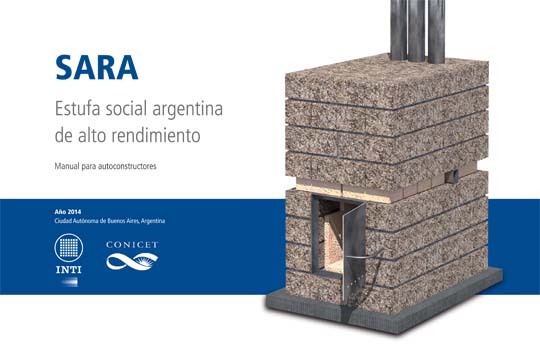 Specialists at the CONICET and the INTI promote the development and the self-construction of a low-cost and high performance stove. How can the heating of most vulnerable populations’ homes be improved? This was the question that led a group of researchers, professors and students at the Faculty of Architecture, Design and Urbanisms of the University of Buenos Aires (FADU) to work with technicians and professionals of the area of Energy and Sustainable Technologies of the National Institute of Industrial Technology (INTI) to find a joint answer for a major problem. “From these two research and development groups, we formed the multidisciplinary team for the creation of a device that any person with minimal knowledge can build by following the instructions of a very simple manual”, Rodolfo Rotondaro, CONICET independent researcher at the FADU, explains. The Argentine Social High Performance stove [estufa Social Argentina de Alto Rendimiento] (SARA) is more economical than any other stove available in the market. This device is made from affordable materials such as adobe, which maintains the heat in the environment for more time than the traditional stoves. Besides, it has a double combustion system that can burn firewood in a more efficient and clean way. Rotondaro comments that the first SARA prototype was designed by both research teams. It was built by INTI-Energía, which assessed the needs of the families who did not have access to an adequate heating system. This device had to operate safely, include smoke control and avoid common risky situations, frequent in braziers and home made stoves that are basic and dangerous at the same time. The transfer manual, edited and published by the INTI, is available online. It is a practical guide for the self-construction of the stove that can be produced with materials available in every region. Furthermore, in a short period of time it can be produced at a domestic scale like the adobe bricks that are part of the structure of the stove. The possibility of building a high performance heating system with a low cost is important to fight the cold in those regions with low temperatures in winter or at night. “Our Science and Technology system is perfectly trained and has senior human resources to provide design and solutions for regional problems taking into account the available resources”, he adds. Rolando González-José, CONICET researcher and director of the Patagonian National Research Center (CENPAT-CONICET), highlights the need to promote the development of SARA in the coldest regions of the country. “This is a concrete example in which the science and technology institutions such as the INTI, the CONICET and the UBA are transferring their advances not only to the society but also to the most vulnerable sectors, with an inclusive point of view”, he states. According to its manual, it has some characteristics that make it more effective, safe and sustainable. • Thermal mass. It is built with adobe bricks, which have a great capacity to store heat. Even if the stove is off, it continues heating the place. It is especially designed for cold areas where stable heat is necessary at night. • Double combustion. It can burn firewood easily, cleanly and beneficially. Thus, the use is more effective because it minimizes the toxic effects produced by burning fuels. • High performance. It transmits more than 70 per cent of the heat produced by combustion of wood. Common stoves such as the salamander only transmit 30 to 50 per cent of the heat they produce. Since 2004, the CENPAT has incorporated the Regional Center of the National Institute of Industrial Technology (INTI in Spanish) led by Hector Zorzi, Technician. Both institutions participate in various interdisciplinary workshops in which they provide technical support or transfer to each organization and its different research teams according to the theme. In can be found online in Spanish (click here), or can be requested via email at estufasara@gmail.com. Users can also send an email to ask for information about the construction process to that email address. On-site workshops – with the participation of people interested in building the stove – can be organized in order to transfer the technology for the construction of the adobes, the stove and its safe and proper operation. For workshops please contact estufasara@inti.gob.ar; estufasara@gmail.com or energia@inti.gob.ar.